Need a little feel-good warm and fuzziness to get you through the rest of the week? The Douglas family has your back. 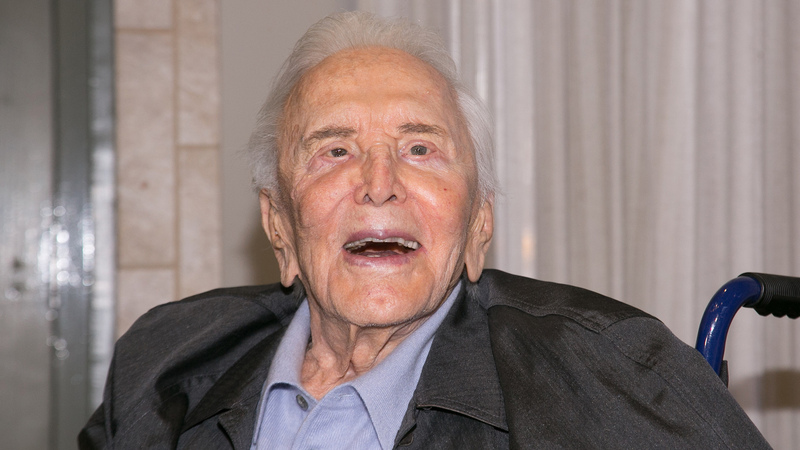 On Tuesday, Kirk Douglas' grandson, Cameron Douglas, shared a black-and-white photo of his 8-month-old daughter, Lua, spending quality time with her 101-year-old great-grandfather, Kirk Douglas. Spoiler alert: The multigenerational snapshot is sure to tug at your heartstrings. The pair’s connection apparently extends to the child’s name too — per People, Cameron and his girlfriend, Vivian Thibes, gave their daughter the middle name Izzy after Kirk, who was born Issur Danielovitch (aka “Izzy”). Kirk and Cameron aren’t the only Douglas men who are wrapped around Lua’s finger, though. In December 2017, Cameron’s father (and Kirk’s son), Michael Douglas, shared the first photo of Lua after her birth. In addition to Cameron, whose mother is Michael's first wife, Diandra Luker, Michael has two other children, Dylan and Carys, with current wife Catherine Zeta-Jones. However, Lua is his only grandchild at this time. Michael’s love for Lua may also be magnified by the fact that she represents a decidedly different chapter for Cameron. “He’s doing great,” Michael told Us Weekly in June of Cameron’s life in the two years since he wrapped a seven-year prison stint for drug charges. These days, Cameron devotes his time to being a family man like Michael and Kirk before him.